Out of the box, WordPress offers a fairly decent SEO solution. But given how much of your business’s success may depend on Google visibility it’s best to go the extra mile these days in ensuring your site conforms to Google’s best practice guidelines for search engine optimization. 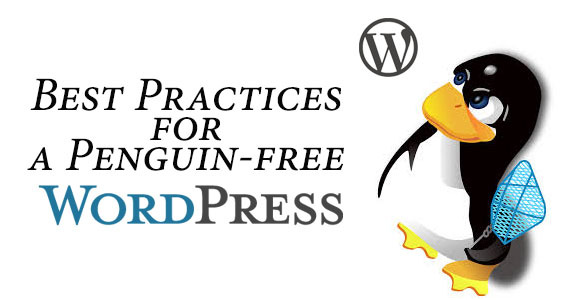 This article covers a few of the most important SEO factors for WordPress blogs which will help you save them from Google Penguin 2.0 and further updates in the near future. But remember that these days, less is more with SEO. Google actively looks for people that ‘over-optimize’ so while it’s great to be attentive to onpage aspects of your site, focus more on running a great business and promoting your brand. That’s not relevant to SEO, I hear you say. The truth is good content remains the best signal you can give Google that your site is relevant and deserves to be placed highly. Don’t worry about keywords and all that jazz, but just write a decent article of at least 500 words, including exciting colourful images and useful outbound links to leaders in your field. Then rinse and repeat, at least once a week forever! Regular updates will keep Google coming back to your site, encourage viral sharing, and improve your brand. This is the most important SEO you can do and without which all others are irrelevant. Most WordPress themes now make use of this automatically but ensure that your article titles are being shown as an H1, and your subtitles – of which every article should have a few – use an H2 or H3. These are strong indicators you can give to Google of what your article is about, and will help you in the SERPS. SEO is basically about communicating to Google what your site is about so it can do its job. Offering Google a proper sitemap, using one of the many plugins available or even better through Webmaster tools is going to do them a huge favour. Remember to exclude any duplicate or thin pages (below about 400 words) from the index via a Robots.txt. The king of WordPress SEO plugins, as far as I’m concerned, is Yoast SEO which offers a huge amount of functionality, including sitemap creation, to help your website gain a better visibility on the search engines. It’s a little tricky to set up, but follow the master’s guidelines on his own site here: http://yoast.com/wordpress/seo/. Using this you can set your permalinks to pretty, add a custom ping list for when you update your site with content, clean up the head and customize your titles and descriptions. Best of all its free, and regularly updated which makes it a true winner. Other plugins we like include Ping Optimizer here is http://wordpress.org/plugins/wordpress-ping-optimizer/, which prevents WordPress from pinging unnecessarily every time your update or edit a post. YARRP or Yet Another Related Posts will also offer SEO functionality by offering your browsers related content below each post you publish. Google loves to see you improving the web and this is a case in point where following their guidelines will translate into Google love. If you’re filling your site with great content, including video and infographics as well as articles of a minimum of 500 words you’re already well ahead of the game. The other base you want to cover is internal linking. With backlinks or external links now much harder to source, Google is placing more emphasis than ever on the type of links you’re making within your site. Say your site is about pet food, and you’ve created a landing page specific to selling your product, you’ll now need to show Google, via internal linking, that said landing page is the most important place on your website to find information on ‘pet food.’ The way to do that is to write some blog posts on that topic, then link back to your landing page with a variety of semantically relevant anchor text. Using a footer link can also be an effective method of doing that, as long as you’re site isn’t thousands of pages in size. But assuming it’s only a smallish site, simply add a footer link which runs site wide to your landing page, with the anchor text ‘pet food’. You’ve now sent Google a strong signal as to what your page is about because all the other pages on the site link to it! Piers Ede is the owner of London SEO firm Barefoot SEO , and a regular speaker at industry conferences on organic SEO.